Pride comes before a fall. For the last 3 years I’ve been ineffably smug about my carrots. They are delicious; crunchy, sweet, and both pest and blemish-free. I grow them on my balcony – 7.5m high. Carrots mostly have one pest, carrot fly. And carrot fly are well-known for only flying a few feet off the ground. Except this year. At least one of the little bleeders has had flying lessons. 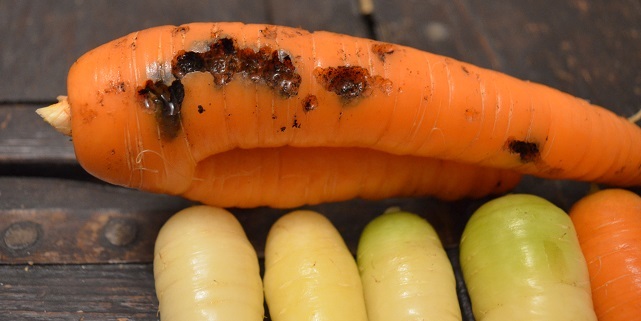 Carrot after carrot has disgusting larvae trails in it. Bizarrely the white ones are the least damaged and the orange are the worst. 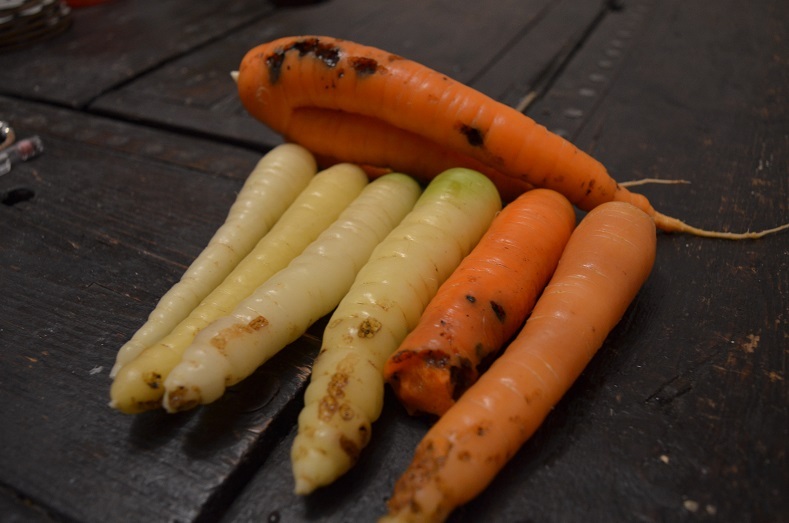 The carrots are still usable, but they aren’t pretty and I’ll need to change the compost if I want to grow them up there again. And perhaps next time take a few more fleece-based precautions. On the plots I am still battling with the hedge. There’s a third to go, and then I can stack and burn the trimmings for woodash to stick under the soft fruit. I have cleared the greenhouse of all but one tomato, and planted some aspirational turnips and spinach in there. It’s probably too late for them to do much, but I don’t need the space and I figure it’s worth a go. I’m still having steady harvests of raspberries, there are 4 late globe artichokes almost at picking stage and cape gooseberries are ripening but still not making it home. My saffron is slowly petering out for the year. I’ve had a fantastic crop, with some of the bigger corms producing up to 4 flowers each. The 3 tubs have only produced 1 flower between them, unless they are saving themselves for a late season flourish. Still the final (dried) weight of my second year crop is 1.1g. 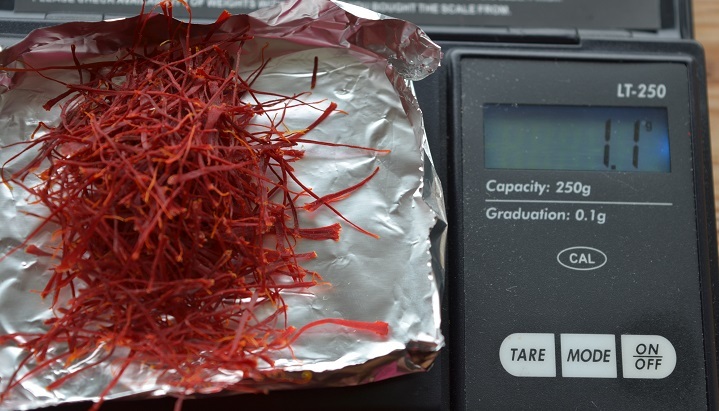 And it’s a completely different spice to shop-bought saffron. It’s much more honeyed in flavour. aromatic and less bitter. 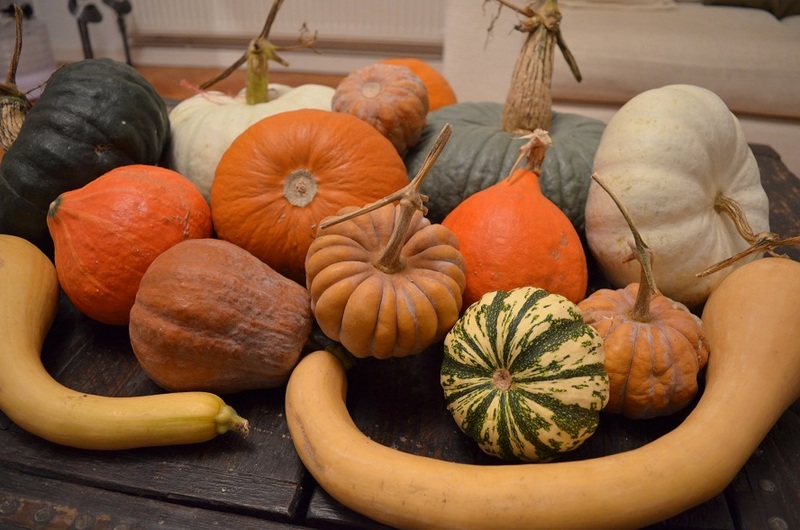 Also now home are the squashes, in a glorious jumble of colours, shapes and sizes. Touch wood they have all been fully cured and will store well at the cooler end of the kitchen through winter. They should see us through till about March if I’m lucky. There is a strict order for them to be eaten in, starting with the ones I hand-pollinated for sharing in seed circles. Potimarron and Black Futsu have become favourites for flavour, but I am hoping for good things from the new ones I’ve grown, particularly the beautiful Shishigatani, Flat White Boer and Berrettina Piacentina squashes.